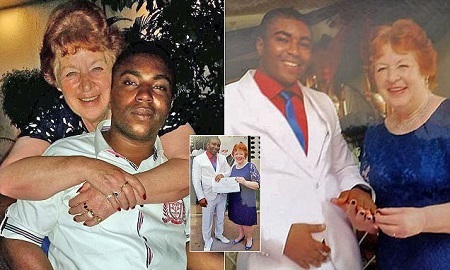 The ex-husband of a grandmother who married a 27-year-old Nigerian man believes her new husband ‘just wants to get into the country’. Angela Nwachukwu has spoken of her heartbreak after husband CJ, who is 45 years her junior, was denied a visa to join her in the UK. The couple met when CJ added Angela, 72, on Facebook, and got married just two months later. But Donald Neate, 71, who was in a relationship with Angela for five years, believes his ex-wife is being ‘scammed’ by her husband, describing her as ‘gullible’. The former lorry driver told Mail Online: ‘We separated 18 years ago and haven’t had any contact since. Despite the pair’s age gap, Angela insists they are very much in love and hoped CJ could join her at her home in Dorset. She has spent £20,000 visiting him in Nigeria, but authorities will not allow him into the UK. They believe he would not leave the country if he was granted a tourist visa.